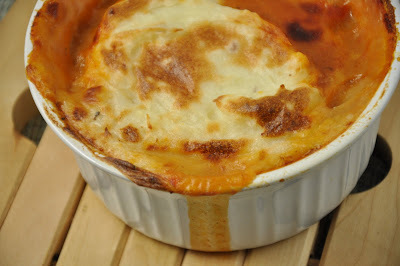 Here's an alternative to corned beef and cabbage for your St. Patty's Day dinner: Shepherd's Pie. It's kinda Irish and it pairs well with beer. And those are pretty much all the requirement's I have for Saint P dinner. I mean, obviously we're also going to drink some whiskey—goes without saying. This recipe for Shepherd's Pie came from a recent Food and Wine, which means the following: lots of cream, butter, and other fatty things. I lightened it a little and even added extra veggies for some of the meat it called for. It makes a nice satisfying meal that will provide you with leftovers (serves 8)—and it definitely gets even better the next day. This is a recipe that requires a good bit of prep time and attention, so make sure you have an hour or two to mess around the kitchen. And I think we all know that prep time is just an excuse we don't need to drink more Irish whiskey. 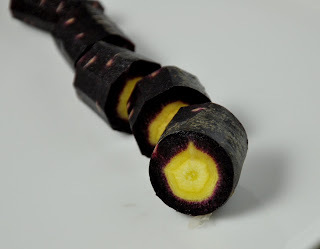 this purple carrot made me think back to season 1 of Dexter, is that wrong? 1. In a large pot (or cast iron skillet) heat the vegetable oil and cook the lamb and ground beef, stirring to crumble the meat. Season with salt and pepper, transfer to a bowl and set aside. 2. Return the pot to the stove and melt the butter. Add veggies, onion through garlic and sauté for 3-4 minutes. Then add thyme, cooking an additional minute. Add the water, salt and pepper. 3. Retrieve the lamb/beef mixture and drain using a colander if necessary. Add the meat to the vegetables, and stir in the tomato paste until well integrated. Add the flour and cook for 1-2 minutes, then add the stock and bring to a boil. Simmer over low heat (uncovered) for about 10 minutes. The mixture should thicken during this time. Taste and add more salt and pepper if necessary. 5. In a medium/large sauce pan, add potatoes and cover with water. Cover pot and bring to a boil until potatoes are tender. 6. Meanwhile, in a medium sauce pan add the milk through nutmeg. Bring to a boil, remove from heat and add the rosemary sprig. Let mixture cool while potatoes finish cooking. Then strain to remove solids. 7. Pre-heat oven to 400°. 8. After potatoes are tender, return them along with the garlic to the pan and cook over high heat for a minute or two to dry out the potatoes. In a bowl, blend/mix the potatoes and the milk mixture. Add the tsp of salt. 9. Spread the potato topping over the lamb/beef filling and bake the pie in the upper third of the oven for 20 minutes. You'll probably want a drip pan under the casserole/ramekins. Turn on the broiler and brown the topping for 2-3 minutes (or until it looks good to you). Let the shepherd's pie rest for 5-10 minutes before serving. Serve with a hearty Irish stout or an English ale. But just to be festive...let's go with the stout. Go here if you still want that corned beef.